Get your front row seat for the Great American Eclipse of 2017 in Myrtle Beach! There’s no better summer vacation destination than the picturesque coastline of Myrtle Beach. Millions of families flock to the Grand Strand to enjoy the endless variety of fabulous dining and attractions that the Myrtle Beach area has to offer, not to mention the luxurious oceanfront condo rentals! 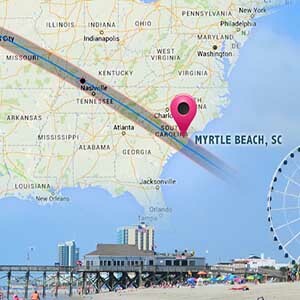 This August, the Myrtle Beach area will be offering an all new attraction of global proportions, as it will play host to one of the best places in the entire United States to view the first Total Solar Eclipse of this millennium! Although the entire contiguous United States will experience The Great American Total Solar Eclipse, there is a stretch of land, about 70 miles wide, that will experience the highest magnitude of this historical event. This prime area of viewership, known as the “Path of Totality,” starts in Oregon and stretches across America to South Carolina! Myrtle Beach is the perfect location to take in the Total Solar Eclipse, as it is less than 75 miles from the Path of Totality, and has thousands of premium oceanfront accommodations that will give you a front row seat to the show of the millennium. Taking in The Great American Total Solar Eclipse from your private, oceanfront balcony is the perfect way to watch it all unfold, as the eclipse will reach totality at approximately 2:45 pm, and the sun will be directly over the ocean! If you did have reason enough to plan your Myrtle Beach Vacation, you do not want to miss The Total Solar Eclipse of 2017 this August 21st in Myrtle Beach! Condo-World has you covered with the luxurious oceanfront accommodations for your family; reserve your Myrtle Beach Condo Rental or North Myrtle Beach Condo Rental soon before you miss your chance to see history! Myrtle Beach will be the place to be to see the total eclipse of 2017! Book your stay and watch as day turns to night during this once in a lifetime event.